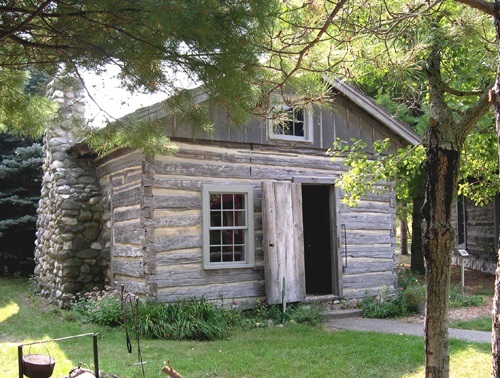 This original log cabin was the first authorized post office in Mason County. It was originally a combination home and post office and was built as early as 1850. William Quevillon (Ku-vee-aw), who first came to this area as a trapper, built this cabin on one of his hunting trips. In 1852 Quevillon brought his wife and their four children on a horse drawn scow, along the beach from Grand Haven to this log cabin. Quevillon was appointed postmaster in 1855 and served in that capacity for 18 years. Postage on a letter from Grand Haven to Fairview (located just south of here in those days) was 50 cents and mail was delivered four times a year! This cabin was moved intact (minus the fireplace) to White Pine Village in 1968. The fireplace was rebuilt, using all local fieldstones.